As employers lament a shortage of skilled workers, families bemoan the cost of higher education, and high schools struggle to prepare students for college and career, one solution is gaining steam: youth apprenticeship. “So, what are you doing next year?” It’s a common question American high school students face from teachers, neighbors, their friends, and parents. For students today, the most common answer is college, with nearly 70 percent of today’s high school graduates enrolling in higher education after graduation. While high school graduation rates are at a historic high, still nearly a third of students do not enroll in postsecondary education after graduation. Of those that do, just over half will graduate with a bachelor’s degree in six years, and their prospects are worse if they start at a two-year college. Among completers, there is no guarantee of a well-paying job to help pay off the over $30,000 debt that today’s college graduates accumulate on average. As policymakers contemplate new ways to prepare students for college and careers, youth apprenticeship stands out as a compelling option. Apprenticeship is a proven educational model that integrates on-the-job and classroom learning. Apprentices gain valuable work experience and access to professional mentors and networks, and earn postsecondary credit and credentials. From day one, an apprentice is a paid employee, developing valuable skills to add productive value while on the job. To realize these potential benefits for students and employers alike, however, youth apprenticeship must function as a partnership across industry, high schools, and postsecondary institutions. 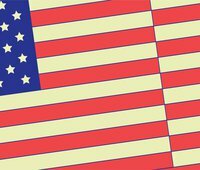 Compared to countries like Germany and Switzerland, youth apprenticeship is an underutilized education and workforce strategy in the U.S., but it's gaining steam in many states. In Youth Apprenticeship in America Today: Connecting High School Students to Apprenticeship, produced with support from the Siemens Foundation, Brent Parton summarizes findings from a year-long research effort that included focus groups, polling, a national landscape scan, and interviews with practitioners and national experts. The report looks back at the history of youth apprenticeship in the U.S. and distills current trends into five key findings. The report uncovers public openness to youth apprenticeship and a diverse landscape of existing programs. Profiles of state strategies depict efforts underway to expand youth apprenticeship opportunities in high-demand industries like advanced manufacturing, business services, information technology, and healthcare. Together these findings set the foundation for a new national conversation about the promise and challenge of growing youth apprenticeship in America today. 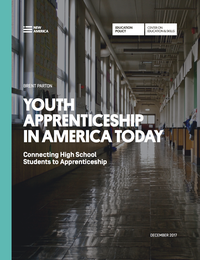 Building off of this report, the Center on Education & Skills at New America is continuing the effort to better understand the landscape and expansion of youth apprenticeship (YA) opportunities nationwide. We're currently working to develop a landscape of existing programs across the US. This landscape will offer a clearer picture of what's going on across the country, and make it possible to create opportunities for leaders like you in states and communities to exchange and share best practices. If you are currently engaged as a leader in a youth apprenticeship program (or are a part of a partnership that is), we want to hear from you. Please tell us about your program and how we can learn more about your important work by completing this short form. With your consent, basic program information (e.g. name, location, industries, URL) will be collected for an interactive map to be displayed our website, and we will reach out to learn more from you and your colleagues.